Well, it's finally here! Madden 12 came out yesterday and we got our advance copy and have had some time to compile our updated list of Madden 12 tips for running, passing, offense and defense in this great new game. The new Madden NFL 12 continues the rich tradition of the storied franchise by delivering on all-new collision system, more than 100 improvements to Franchise and Superstar modes, online communities, and the most innovative presentation ever in Madden NFL History. The Wii version of Madden 12 is completely worthless so we're not even going to discuss that - Wii is good if you're a little kid and playing Sonic the Hedgehog. The only system you should be playing any EA sports games on is the PS3 - period. As always in Madden, less is more. The right joystick is still the key to a successful running game. Use the right joystick to juke from left to right, and also to truck stick by moving the right joystick forward. As is typical of Madden games of the past, running outside is going to be tough against the computer on the higher level settings. It is best to run up the gut. HB inside out of the near formation is still a great play. Start your fullback in motion and then kick the play in gear as soon as the fullback gets behind your guard. Stay alert and don't start smashing all of the buttons, it is better to really watch for the holes and use the joysticks to navigate before using any of the buttons. The only button that we like while rushing is the X button. And actually you should always default to the X button for any position, offense or defense when playing Madden 12. The X button basically tells the computer to do what that player is supposed to do at that given moment. It's kind of a "catch-all" button. If in doubt, hit X. We have a sneaking suspicion that even though Madden 12 and EA Sports claim that there is no more turbo button, we still think that holding down R2 when it's time to boogie is the right move. Madden has once again made it very difficult to throw the ball to the outside wide receivers. There are a few tips that show that if you position your QB on the hash mark and throw to the outside wide out streaking up the sideline that he will be open. So, let's say you are in the Tight Slots formation, get your QB on the left hash mark and throw to the left wide out going down the left sideline. When executing this play, make sure that you have a receiver coming from the right side doing a shallow drag route just in case the receiver is blanketed, then you can dump the pass off short. This Madden 12 passing tip also works with the Trips Wide formation. Send your right receiver in motion and just when he gets started in motion, snap the ball, get your QB's feet on the left hash mark and hit the left wide out heading down the sideline. The biggest mistake that most QB's make in Madden 12 is making the wrong choice of when to throw a bullet pass (hold down button) or to make a lob pass (tap button), or do something in between (just feel it out). A common mistake is to throw a bullet pass across the middle because the linebackers will jump up and either knock the ball down or they will intercept the pass. 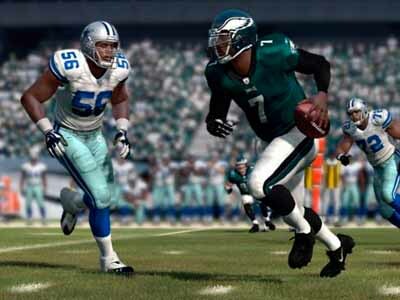 We hope that enjoyed our new Madden 12 tips for running and passing and we will see you online!